The little ‘Ke-Nu’ has been primer coated. This is my first experience with airbrushing Vallejo’s acrylic Gray Primer. I set the air pressure to 12 PSI and tried shooting this stuff straight out of the bottle but the primer came out grainy. A few drops of both distilled water and Liquitex’s Flow-Aid did the trick. The primer was still a tad bit grainy but I thought it looked good and replicated a nice slightly rough finish on the thicker armor plates. Thinning it further I finished off the rest of the model. 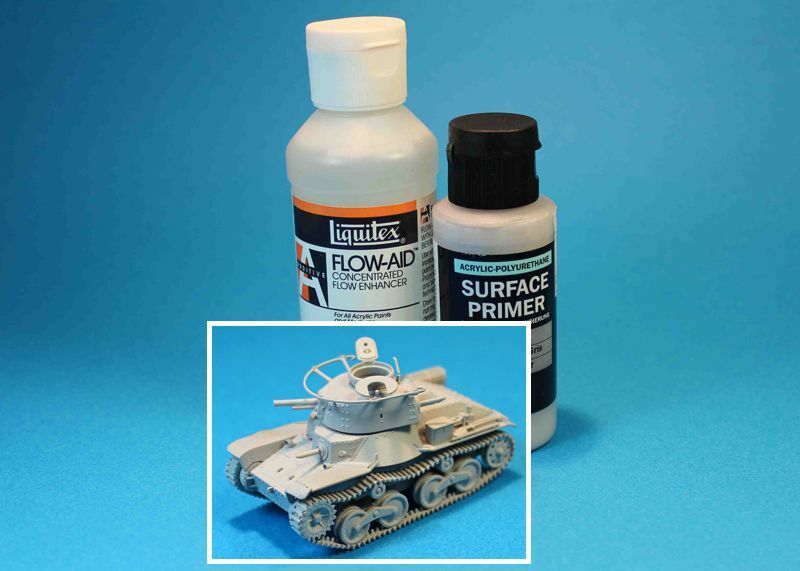 Next time I use this primer I’ll try adding Model Masters Acryl ® Thinner to the mix and see how that sprays out? Using the same air pressure settings the model received an overall base coating of Tamiya’s XF-60 Dark Yellow @40%, X-22 Clear @30% and Lacquer thinner @30% (your mileage may very depending on altitude, humidity and temperature). I then progressively lightened the color to the sun exposed upper surfaces of the model by adding X-57 Buff to the above mentioned mixture. Only the highest upper horizontal surfaces received an even lighter color by adding XF-2 White to the mixture. I have an old model jet airplane that I use for test painting first before apply it to the model. I don’t pre-shade, as it tends to leave the model looking too dark in this scale. This is especially evident when all of the finishing steps have been applied (filters, oils, and weathering). The primary camouflage colors come next. I’m not exactly certain how to go about using Matthew ‘firstcircle’ Lenton’s toothpaste technique for this purpose so I will have to do a little reading. Thanks for dropping in, more coming! That is a fantastic wee 'Ke-Nu'!!! Great detail for such a tiny tank...well done my friend! Eddy, you make it look so easy! Thanks for posting a blog like this and it's caught my interest in these odd Japanese tanks. I'm tempted to get off my chair and actually try one. Incredible yet simple, this is a great build Eddy. Just sorry I didn't catch it earlier. I really like the DS tracks in their braille kits, they are a world apart from the standard rubber band tracks. Good to hear you like it, thanks for stopping by! Ah . . .Sonny, do you have a braille project brewing you might what to share with us? Bro, king of the paint finishes, thanks for dropping by! Yup, a lot of detail crammed into a small piece of plastic. Hoping my finishing effort on this one comes out half as good as those you render on your builds? Grab one and go for it! These kits are well detailed and go together well. Although you’ll find you have to contend with the parts fit on the suspension, something I’m sure with your experience you can easily handle. Thanks for stopping by and leaving a comment. Yes, I also like Dragon’s DS tracks, especially in this scale. 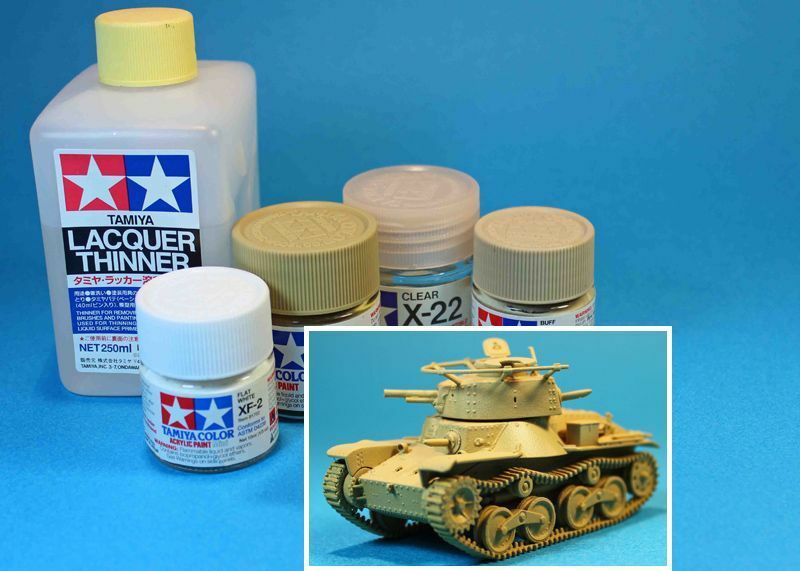 For me these tracks are easy to install, glue down well with liquid modeling glue, are well detailed throughout, can be carefully stretched to replicate track sag and accepts both acrylic and enamel modeling paints. Thank you all for stopping by and leaving a comment I appreciate it and appreciate your time in doing so. I would have answered everyone in a more timely manner but I have not been receiving an email notification when someone posts. Been busy getting ready for the holidays . . . to all have a happy and joyful Merry Christmas! Enjoy the festivities and don't get to big. . .
Nearly 6 years later... but what ever happened to this project? Agree...would like to see the finish line of this one! Yes it's been a long time. Lot of water has passed under this bridge but I'm back (no I haven't been in jail). I will be updating this post sometime this coming year. I just enlisted in the MBT Campaign as I need to restart and relearn my modeling skills, posting and photography all over again. Thank you all for your support and interest it is much appreciated. SO, you now treading into the "Dark Side" of the "LEGO Types"? I know what it's like to need time to "reacclimatize" to the wonderful world of modelling and the necessity to have to reacquire those skills that unfortunately have been dormant for an extended period. Good luck and a speedy reacquaintment with the required skills. Thank you, I've been waiting for a long time and the time has finally come to enjoy sniffing glue, cutting your fingers, super gluing your hands to your latest project and just plane old messing with the plastic parts. I can't wait! Yes, I need to start with the Lego sized bricks to get a handle on things again, hihi! Actually I find that it takes just as long to put together a 35th scale build as it does a 72nd scale build, go figure?